Are you stick of hearing stories about me adjusting to life after Kansas City? Well I have one more today and it revolves around Trader Joe’s and a salsa that I found there about two weeks before we moved our lives to Central Missouri. 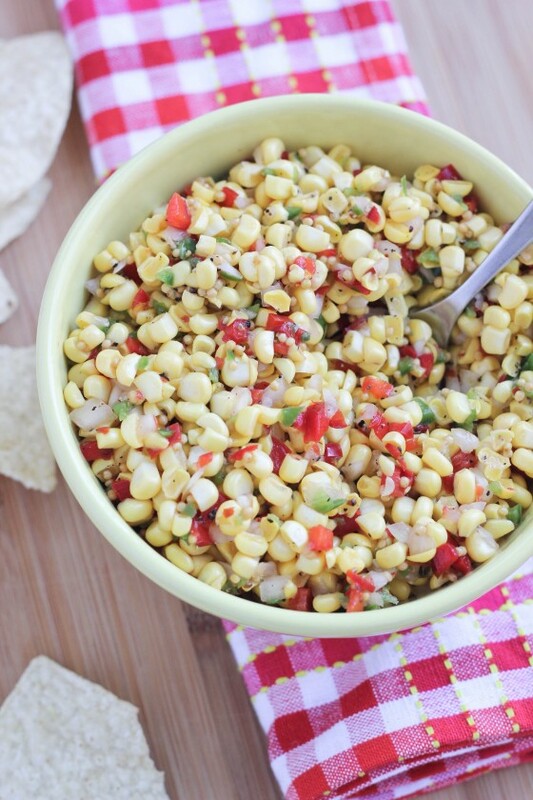 Tomato-less Sweet Corn & Pepper Salsa. It’s slightly sweet with a hint of spice and beautiful textures that I – kid you not – discovered two weeks before we moved. Why is this an issue? Well, because we are at least two hours from the nearest TJ’s. This is troublesome, my friends. My favorite wine, my favorite cheese, my favorite coffee and now my favorite sweet corn salsa can only be found in that funky little store. I’m done ranting now. Not because they have decided to build a Trader Joe’s here but because it’s summer time and because sweet corn is readily available at my local farmer’s market, along with red bell peppers and jalapeno peppers and combined together with some onions, sugar, mustard seed and seasonings, I made what I believe to be a pretty close competitor. Paul, although biased, voted mine to be better – it tasted fresher with farmer’s market ingredients and he thought the sweetness was much more balanced in the fresh version. I might be able to make it without a TJ’s after all! And what better salsa to kick off summer on Memorial Day. Your BBQ won’t be complete without this perfect sweet and spicy mix! 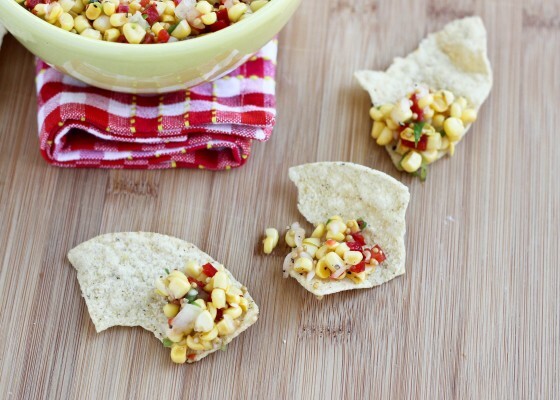 The full recipe can be found at Imperial Sugar: Sweet Corn & Pepper Salsa! Disclosure: I have an ongoing relationship with Imperial Sugar for recipe development. All opinions are my own. I live an hour from TJs and thats pretty much hard enough. So when I go I spend a billion dollars on too much food that I will never be able to finish in time…. This salsa looks slammin! I’ve never even been to TJ’s. Boohoohoo! 🙁 Hopefully our next move puts us close to one! This salsa looks amazing. I love corn salsa! That’s the pits that you discovered it 2w before your move. Great job on recreating – necessity is the mother of invention! I have NEVER been to a Trader Joe’s, but I’m happy to report that we are finally getting one next year in Central FLorida! Until then I need to go make this recipe! No Trader Joes anywhere in Colorado, but we had one back in Ohio and boy do it miss it! 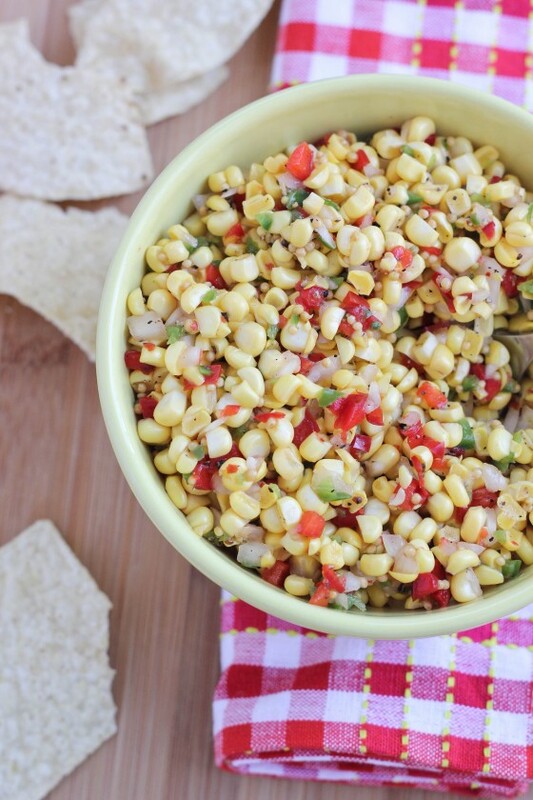 I never tried the corn salsa, but wow this looks so good and really perfect for summer! Love this! And you’re not alone with being so far away from TJ’s. I’m smack in between 3 but they’re all at least an hour away – totally not a realistic grocery trip. I guess I shouldn’t mention that I’m just 5 minutes down the road from a TJ’s. Should I mention that? No? Okay. I live close to a Trader Joe’s, but I’d still much rather make my own salsa. This looks delicious! I think I’d eat it with fish or chicken. Looks delicious! I love salsa of all kinds-especially with Farmer’s Market produce! I’m about 30 minutes from a Trader Joe’s and I’ve only been once. We have a new market called Sprouts that I just love. This salad looks great and so happy that you like it better! Sigh, I wish there was a Trader Joes in Colorado! Someday. But until then, I am totally making this salsa to cope! We just got our first TJs a few months ago, but I think I’d still chose your version! This looks delicious and the tomatoless thing is a plus for me because the men in my family HATE tomatoes!! This is great! Living in DC, I have an embarrassing number of TJs nearby and I have always loved their corn salsa, except – I think it is TOO sweet. I am not sure why it never occured to me to just make it myself. Thanks! I honestly can’t imagine life without a TJ’s but I bet it will just inspire you to make a lot of things yourself! I’ve never actually had the TJ’s version of this but it sounds like a salsa I definitely need in my life! i hear ya! i love that salsa (and a myriad of other products) at TJs…but i live about 90 minutes from one so it’s kinda no fun at all. but truthfully, it DOES make the occasions to go there much more special. this salsa looks fantastic. no idea why i’ve never made a copycat. Love this salsa! I am who knows how far away from a TJ’s, so I miss out on all the yumminess. Now I don’t have to! Wish I had all the ingredients, because this would be great on our tacos at dinner tonight. It was less than a year ago that I stepped into a Trader Joe’s for the first time…and I’m in CA where they are plenty. I fell in love instantly. Just like this corn salsa. I could eat that entire bowl without blinking. I’ve never tried this salsa from TJ’s; I’ll have to keep an eye out for it. Sounds perfect for summer bbq season! Oh, I SO have a soft spot for TJ’s corn salsa! It’s really good mashed into an avocado or on top of a spinach salad (not that I spent a whole summer putting it on everything to see what tasted the best…or anything). TJ’s is 2 hrs away from you? You poor thing! Send me your address – I’m sending you a box full of TJ’s goodies! Looks awesome, Cassie! We’re only about 30 minutes from a TJs, but it’s juuuuust far enough with two kids that I go maybe once every six months. I could go for a giant bowl of this! Looks so good! That corn salsa from TJ’s is the best. My boyfriend won’t eat tomatoes so I will have to make this for our summer BBQ’s. What a perfect BBQ side dish, Cassie!!! I love this x 100! I want a giant spoon – cause all this is gettin’ eatin’! This looks SO perfect for BBQs, Cassie! I’d be just as quick to scoop it as a side as I would to pile it on top of grilled chicken. Great recipe! This looks AWESOME. My fav last summer was this one: http://thepioneerwoman.com/cooking/2009/08/fresh-corn-avocado-salsa/. Looking forward to trying this one! This salsa looks amazing! I love TJ’s and have somehow missed this – can’t wait to make it at home! We just got a TJ! Finally! We love their corn salsa. But your recipe looks fantastic, too! Corn salsa is one of my faves and I have not had TJ’s version. This looks so good! I love TJ’s! My kids love their yogurt and shortbread cookie star covered in yogurt coating (I sneak some too)! Totally making this salad this weekend! This looks so great Cassie and I may just have to make it to bring to the lake cabin this weekend! I’ve too just discovered the corn salsa from TJ’s. I’m obsessed. We’ve gone through two jars in the last few weeks. I can’t wait to try your homemade version! this is one of our standbys at Trader Joe’s! Our favorite thing to do it mix it with a few tbsp of sour cream and some shredded cheese….you must try!!!! Love corn salsas! I haven’t had TJ’s… but who cares? I can make your copy-cat version :9 I’m totally diggin’ this Cassie! I’ve been waiting for a good copycat! Love it! I must try this, I love TJ’s jar of this salsa. Have moved to Sweden where, needless to say, we are half a world away from TJs. I have bought all ingredients for our favorite corn salsa, but I do wonder about the vinegar. Only 1 teaspoon? My memory tells me the salsa tasted “pickled”. Can this be achieved with only one t? Please let me know if this is a typo. Hi Annelie, I used only one teaspoon of vinegar in the recipe and the flavor was plentiful. Feel free to adjust the vinegar to your taste. This is my favorite salsa. I eat it with whole wheat baked pita chips and my sister always brings me back a can of the salsa when she comes home. (I live two hours west of KC and she lives in a KC, KS suburb). I will try to make this copycat version because it is pretty much amazing salsa. PS. I am pinning this to my Pinterest board. You may become famous. This is fantastic on grilled salmon! I’m gonna make a big batch and can it tonight.